My Dog Ate A Bird: What to Do Next? Is It Dangerous? You are here: Home / Health / My Dog Ate A Bird: What to Do Next? “My dog ate a bird.” It may be an unexpected thing for dog owners to say, but it happens. Unfortunately, like cats, dog also can chase, capture and eat our feathered friends. All dogs are carnivores descended from the gray wolf. They have a natural instinct to hunt prey and this includes birds. Some breeds were in fact bred specifically to hunt and capture birds. Hound dogs and certain Terriers have a strong prey drive that can be difficult to overcome. In this article, we’ll take a look at what you should do if your dog ate a bird and how to get him to stop. Is it Safe for My Dog to Eat a Bird? It can be disturbing to know that your dog has eaten a bird, especially if you’re a bird lover. And now you’re wondering if the bird is going to make your dog sick. 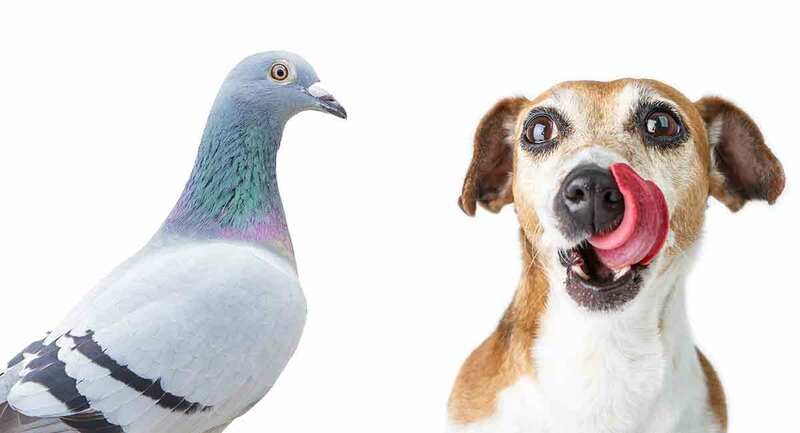 While there’s a good chance that your dog will be fine, there are some serious health concerns that can arise from eating a bird. Some birds carry salmonella in their intestinal tracts. It’s possible for your dog to become infected if they eat one of these birds. Garbage toxicosis or gastroenteritis, more commonly known as “garbage gut,” is usually caused when dogs eat spoiled food that’s contaminated with bacteria and other toxic organisms. It’s similar to food poisoning in people. This bacteria gets into the dog’s digestive tract where it can create toxins that get into the bloodstream. Dogs can also get garbage toxicosis from eating dead animals such as birds. Another possible threat is West Nile Virus, which causes brain inflammation. It’s typically transmitted through an infected mosquito bite. However, your dog can contract it by eating or having contact with an infected bird. Thankfully, West Nile Virus is fairly uncommon in dogs. Is it Safe for My Dog to Eat Bird Droppings? If your dog eats bird droppings there’s a possible risk of him contracting avian flu. Histoplasmosis is a non-contagious fungal infection. This fungus is often found in soil that’s been contaminated with bird droppings. If your dog scratches or digs in tainted dirt, he could inhale or ingest the fungus which then enters his intestinal tract and allows the disease to develop. My Dog Ate a Bird: What Should I Do? If your dog isn’t showing any ill effects from eating a bird, there may be nothing to worry about. If he has diarrhea or starts vomiting, take him to the vet immediately. There is a possibility of salmonella infection when eating raw bird meat. Bones or feathers are not very digestible. They can cause an obstruction in his gastrointestinal tract that could also be an emergency situation. It doesn’t hurt to contact the vet to see if they think you should bring your dog in. This will give you peace of mind and your vet will have background information should the situation take a turn for the worse. What Symptoms Will My Dog Show If They Have Eaten a Bird? If your dog has eaten a bird and shows any of the following symptoms you should take him to the vet immediately. It can lead to gastroenteritis, which is an inflammation of the gastrointestinal tract. Septicemia also referred to as blood poisoning and septic fever, mean toxins can be carried to their entire body through the bloodstream. Dogs who spend a lot of time outdoors are most at risk for garbage toxicosis. Although avian flu is relatively rare in dogs, this study found that they are highly susceptible to the H5N1 avian influenza virus. Anorexia, fever, conjunctivitis, labored breathing, and cough, are the symptoms of avian flu according to this study. Luckily, most cases of West Nile Virus in dogs have been mild. Why Would My Dog Want to Eat a Bird? Many dogs were bred to hunt and have been doing so for hundreds of years. Some breeds were specifically bred to track birds. This includes the Labrador Retriever who was brought to England in the 19th century and refined for hunting waterfowl. The Golden Retriever’s attraction to water made him ideal for hunting ducks. The Boykin Spaniel was originally bred by South Carolina hunters in the early 1900s for stalking wild turkeys. Dead or alive, birds are seen as prey. Even breeds who weren’t bred to hunt can derive great pleasure from chasing and eating birds. This is normal dog behavior. They’re curious creatures and have excellent eyesight and an even better sense of smell. Something that’s fluttering around them is fascinating to them. All dogs are carnivores and it’s their natural instinct to chase, catch, kill, and eat. Although your dog’s desire to chase and eat birds is instinctual, it’s probably not something you want them to do. Not to mention, how the birds feel about it. It may be almost impossible to curb your dog’s natural urges entirely, but it is possible to redirect their interest, at least to some degree. As with any training, the earlier you start, the easier it is for your dog and for you. When your dog is on a leash, you have control of the situation. This is particularly important if you’re walking where there are water birds who aren’t able to take flight quickly. Ground birds, especially if they’re nesting, would be highly at risk. Baby birds would be very easy prey for a dog. Adding a bell to your dog’s collar is another option. It will alert the birds and give them a chance to make a getaway. Keep in mind that your dog’s prey drive is pretty powerful. This technique can take some trial and error. However, using their exceptional sense of smell to distract them and control their attention can work quite well. It’s best to start redirection training in a setting where there are few distractions and gradually move to areas where there are more birds. When you take your dog out for a walk bring along his favorite treats. If you notice your dog is being fiercely attentive to birds, use the treat to gain his attention. Hold out this tempting morsel as you pass by the birds. Ensuring your dog gets enough daily activity will go a long way to discourage not only chasing and killing birds, but numerous other bad behaviors. A dog who has too much pent-up energy, or is bored and lonely, is more prone to destructive and unwanted habits. It stands to reason that if he gets enough exercise, he’ll be too tired to chase birds. This obedience training staple is probably the most important command you’ll teach your puppy. Keep this a special word that’s used consistently and only for the recall purpose. It doesn’t matter what the word is. It can be “come” or “here,” but you must only use it in training when he’s running towards you. This will develop the link between the act of coming to you and the word you want him to respond to. It’s best to start training where there are few distractions. When he responds properly, make sure to reward him with praise or treats. Eventually you can take him to where there are birds or other diversions. Dog whistles are sometimes helpful with this training. Their distinctive sound is easy for the dog to recognize and locate. If you want more information about how to teach your dog the all-important recall command, click here. If your dog eats a bird there’s a good chance that they’ll be completely fine. After all, dogs were scavenging for food for a very long time before they became pampered household pets. Although it’s not something we like to think about, chasing and eating animals like birds is something your dog enjoys doing. There are, however, some real concerns associated with dogs eating birds and their droppings. If your dog has symptoms like vomiting or diarrhea you should take him to the vet immediately. It might just be an upset stomach, but considering the serious diseases that it could potentially be, it’s better to be safe than sorry.